Bryan, Rachel and Kyle fend off attacks from Plesiosaurs & Rhamphorhynchi while watching Legend of Dinosaurs & Monster Birds (1977). In this episode we check out a 1977 monster movie from Toei called Legend of Dinosaurs & Monster Birds, which is far more a Jaws ripoff than a kaiju film. This was a film that most of us were not really aware of until recently, and I can honestly say that even if you are a kaiju completionist, you could probably avoid this flick and we would never judge you. Regardless, there’s more for the episode than the discussion, we also had some news and catastrophic events – then there’s always music to play! For anyone who wants to see what the “kaiju” in the “lake” at Toei Studio Movie Park looks like, here you go. This is not a drill, Toho’s newest giant monster movie is opening in North America next month and we expect a LOT of listeners to go see Shin Godzilla on the big screen and submit their thoughts questions and reviews for our discussion episode. If you would like to join in the fun, make sure to submit your review via our contact page before October 24th — and if you want to record an audio version of your “homework” just send us a link to download the file. 1. Do not send a file that’s longer than three minutes. 2. 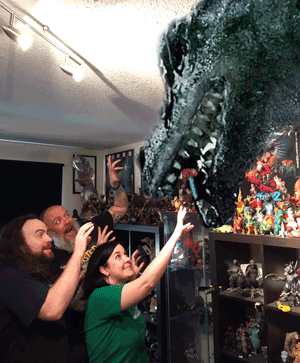 Do not swear – the Kaijucast is a family friendly show, of course. 3. Try to have your talking points hammered out before you even start recording (that’s just general podcasting advice though).